Is your website a WordPress site? 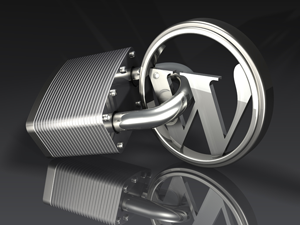 This fall seems to have been a field day for WordPress hackers. Even with good security, several of my clients’ sites were hacked. What can you do about it? Realistically, you can’t stop the bad guys. Hackers are a unique group of people hell bent on destroying the work of others. Sound like I’m frustrated? I am! Sick to death of dealing with people who clearly have no respect for the hard work (and money) of others. Keep your plugins AND WordPress updated! Despite the many ardent warnings I have given my clients, who don’t want to pay me to do regular updates, the vast majority completely ignore what I tell them and that is to UPDATE, UPDATE, UPDATE! Updating literally takes minutes per week. 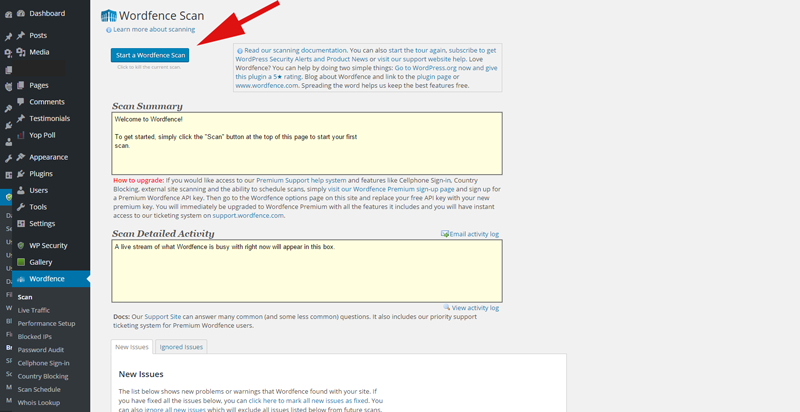 Click on the button indicated with a red arrow “Start a Wordfence Scan”. It may take a little while the first time, but after the first time, it will continuously scan your site and watch for malware as well as assist in blocking attempts to force their way in. 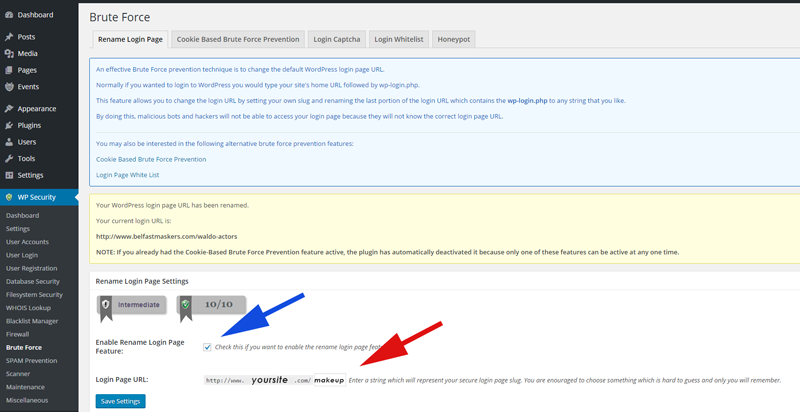 Make sure to 1) Check the box indicated by the blue arrow, and 2) inside the box indicated by the red arrow where the word “makeup” is, make up your own admin panel access name. Make sure it is something unique and not easy to guess. It’s best if you use a mix of alphanumeric characters, capital and lower case. The harder it is for them to figure out, the safer it is. Susan Totman is a professional WordPress, Joomla! and Small Business Consultant, having 12+ years experience with both platforms and 27+ years as a virtual business owner. Contact Susan HERE to set up a consult or assistance with related services. If you have an emergency issue that you need immediate assistance, please contact us HERE and we will get back to you shortly.